Dehradun, 7 Feb (IANS): Industrial pollution in tributaries of the Ganga in Uttarakhand is safe enough for pilgrims to take the holy dip in the river during the Magh and Kumbh melas, say experts. The Central Pollution Control Board (CPCB) had recently directed the Uttarakhand Environment Protection and Pollution Control Board (UEPPCB) to control discharge of coloured effluents in the tributaries of the Ganga in the Kumaon region, which is a hub of liquor distilleries, paper and sugar mills. Industrial waste is the main cause of water pollution and mills here have been discharging effluents in the Dhela, Behla and Kosi tributaries of the Ganga for long. The permissible limit of discharge under environmental protection norms is up to 50 hazen. As the Kumbh and Magh melas began last month, the CPCB strictly barred the hill state from discharging industrial waste into these tributaries. 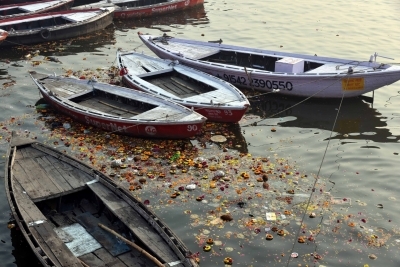 "We immediately asked these industries to use latest technology to fully control the pollution in the rivers, which they fully complied to," said Ankur Kansal, environmental scientist at the UEPPCB here. However, since there is no sewage treatment plant in Kumoan, effluent pollution remained at 15-20 hazen in these rivers which was far below the permissible level. "As of now, the coloured water pollution is at an average of 15-20 hazen at all the monitoring points on the Uttarakhand-Uttar Pradesh border," Kansal said. 01 Ask a counsellor: My husband has a drink problem – what do I do? 05 Ask an expert: What are DOMS and how can I reduce the aches and pains?